Los Angeles students at the DML Conference in San Francisco show the devices they want to use in school. We've heard arguments from ed tech experts about how using technology for learning may in fact deepen the divide between wealthy and low-income kids. Students who have access to technology and are encouraged by teachers and parents to leverage it for new ways of learning, the argument goes, will leap even further ahead than low-income students who are forbidden to use it in public schools. Those arguments were personified last week in the collective voices of students from Morningside, Crenshaw, Roosevelt, Locke, and Manual Arts high schools, who presented their case at the Digital Media and Learning conference in San Francisco. Holding up cell phones, tablets, and video cameras, students spelled out to listeners in the packed conference room a message loud and clear: We demand access to the same technology that privileged students have in order to survive in the working world, to compete in any meaningful way, and to amplify our voices. Students from the five schools who comprised Black Male Academy and Council on Youth Research, and who had raised the funds to get themselves from Los Angeles to the conference on Kickstarter, presented research they'd gathered at their own schools about the impact of technology (or lack thereof) on their learning. "We're going to use technology to start a revolution, to improve our lives, and the lives of the upcoming generations, to get our voices heard," said a Morningside High student. "How are we supposed to use technology responsibly if we don't use it at all?" In their own words, they described their frustration with their schools' prohibitive policies on using technology and the dismal condition of the schools' tech equipment. "We don't have the basic needs that students at Beverly Hills High have," said Myquesha Moore from Crenshaw High. "Why should l have to go to a library outside my school to have access to computers that are available, but limited? Yes, we're learning to type on our T-Mobile Sidekicks, because we're taking our own initiative. But we're crucified by a process that's making us a permanent underclass. We are forced to stay at the bottom, and this lack of technology will not allow us to develop skills for the job market. 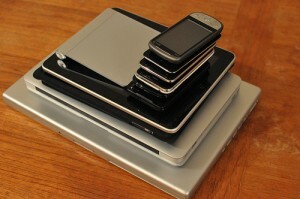 Budget cuts can no longer be a reason why me and my peers are tech-illiterate. We've had this problem since before the economic crisis." "I demand that my peers and inner city school kids have a fair chance at life, furthering their education like privileged communities," she continued. "Give us the resources we need. Because there are children like me who give a damn about our future." Students presented research they'd conducted using their own cameras, tablets, laptops, and cell phones to capture data. They used documentary filmmaking, online surveys, and face-to-face interviews, and came up with some unsurprising conclusions. At Morningside High, for example, though 49% of students said they use the Internet to do their homework, the majority agree that it's not easily available in school. And although digital media has helped students tell their stories in interesting ways and kept them interested and focused, they said it's rarely used in their schools. "If our school has technology and equitable resources, our graduation rates and college attendance rates will increase," a Morningside High student said. "This means we'll have more prepared students for our democracy, and we'll have more public conversations about equity." "Be aware of your students' needs. Make sure you have space for students to speak freely." "We want students to use their voices to speak up for themselves," another said. "We demand good quality teachers who will allow students to use the tools, smartphones, tablets, they already have to learn. And we demand that parents back us up." Students from Crenshaw High described the obstacles they face in completing simple school assignments, and presented some grim numbers. Only 10 out 14 computers work, two are new, and three can print. The entire school has three laptop carts, and only 10 of the 30 laptops can access the Internet. And 90% of computers operate on Windows 2001, the students said. "It burns me up inside that I have to scramble around to try to find a computer at a library," a Crenshaw student said. "I get assignments that require the use of a computer, and even if I find one at the library, my time is up after an hour and I have to get off the computer and find another one." "My cell phone has better Internet access than our school's computers," another student said. "I demand my teachers incorporate the use of cell phones by finding innovative ways to use them for educational purposes." Showing the benefits of how tech can be fruitfully used in schools, students from Manual Arts demonstrated how some teachers use Edmodo to communicate with them and share content for class projects, as well as blogs, flip cams, laptops, and cell phones. Locke High School students showed a short film dramatizing their technical tribulations. "I almost got my phone taken away for filling out a job application." "I got in trouble for checking the time on my phone." "My teacher wouldn't let me take notes on my laptop." "I can't believe I failed my math test because I couldn't use the calculator on my iPod." 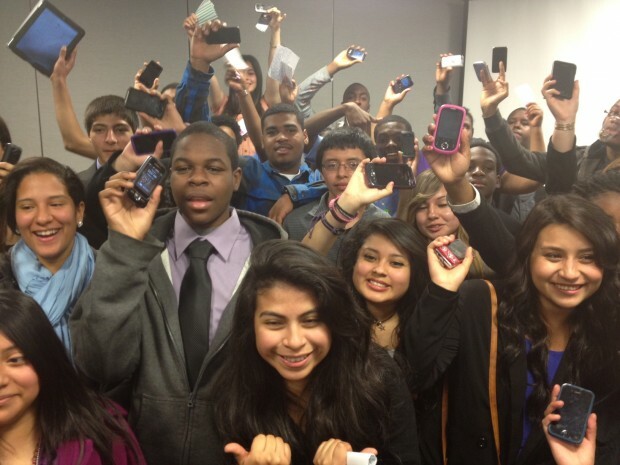 For At-Risk Youth, Is Learning Digital Media a Luxury? What Exactly Can You Learn On a Mobile Phone? How Do We Address the Needs of Kids Without Mobile Access? One by one, students pleaded their case. Though some teachers and administrators think of social media sites like Facebook as being distracting and ultimately harmful, students said it can be used as a tool for learning, for example by creating class topics. "Plus, there's no time limit to Facebook," a student said. "Learning stops when class ends at school, but learning happens outside school too. We use Facebook to create a dialogue between teachers and students. We can use Facebook to speak our minds and make changes, share our thoughts, our notes, and resources." They asked rhetorical questions that addressed what they've been battling at their schools: "Doesn't it make sense to use the tools that engage us the most? How are we supposed to use technology responsibly if we don't use it at all? Why aren't schools creating culturally relevant curriculum?" Asked whether she'd presented this information and list of demands to her school administrators at Crenshaw, Myquesha Moore said the conference was the first time her group had done a public presentation, but said they will when they return. This kind of grassroots movement on the part of students might be the push some teachers have been waiting for. At a different conference session that included some of the same students the day before, a teacher from West Adams Prep, part of the Los Angeles Unified School District, said it's time for students to stand up for themselves. "I feel powerless as a teacher at L.A.U.S.D.," she said. "You guys need to speak to the board or the superintendent. You need to gather your peers and go to news outlets. Think about something you can do to raise awareness. You live in L.A. -- get on the 'Ellen' show. You need to speak up and use your voice politically. There needs to be a revolution." A school technologist stood up to say that although he has to buy a content filter to qualify for the federal government's discounted E-rate program for broadband, he can configure the filter to his own discretion. Hearing the voices of adults weigh in on the matter may go a long way for these students, many of whom say they don't believe adults care about them. One teacher asked a student panelist how to direct kids to using technology for learning and empowerment rather than for unrelated purposes. "For every student who uses 140 characters to send messages of empowerment, there's another who's tweeting inappropriate photos," she said. "For every student who's using YouTube to learn, there are others who are posting fighting videos. What are some ways you learned to be responsible digital citizens?" In reply, one of the students said it's about students' need for attention and guidance from adults they think care about them. "Kids who have straight A's and are college bound, that's because people have been there in their lives to show them the way," she said. "For those students who aren't doing well, it's a process of talking and having conversations with those students. Ask them why is that student being distracted? Why is he doing that instead of doing work? With kids and with parents, sometimes you have to pressure them and push them. It takes a lot of patience but you have to have those conversations and monitor what that student does." Another student also suggested that the teacher talk to the student who's posted inappropriate photos. "Ask her what's going on in her life, what is she going through," she said. To educators and schools, the students' main message was about being heard -- whether it was related to using technology or about other issues: "Be aware of your students' needs. Make sure you have space for students to speak freely."